Using Rx Simparica is an effective means of combating fleas and ticks as well as preventing the diseases spread by those pesky invertebrates. When this medication is applied, it acts quickly, killing fleas within a three-hour time frame and effectively doing away with ticks within an eight-hour time frame. This is especially handy if you live near a wooded area where fleas and ticks are more prevalent. With such a fast-acting product, you can dispose of the pests and everything that comes with them in a matter of hours! So if you are looking for a fast-acting and ideal way of relieving a current infestation in your dog's condition, this is the product to turn to. Once the tablet has been ingested, Simparica enacts a prevention period lasting a full 35 days! Its period of effectiveness is even longer than most other flea and tick medications. So your dog experiences their needed monthly pest prevention, plus a little more! Those last five days will be five more days without irritating itches and scratches. What's more, it is a consistently effective medication which does not diminish its potency as it reaches the end of the 35-day span. 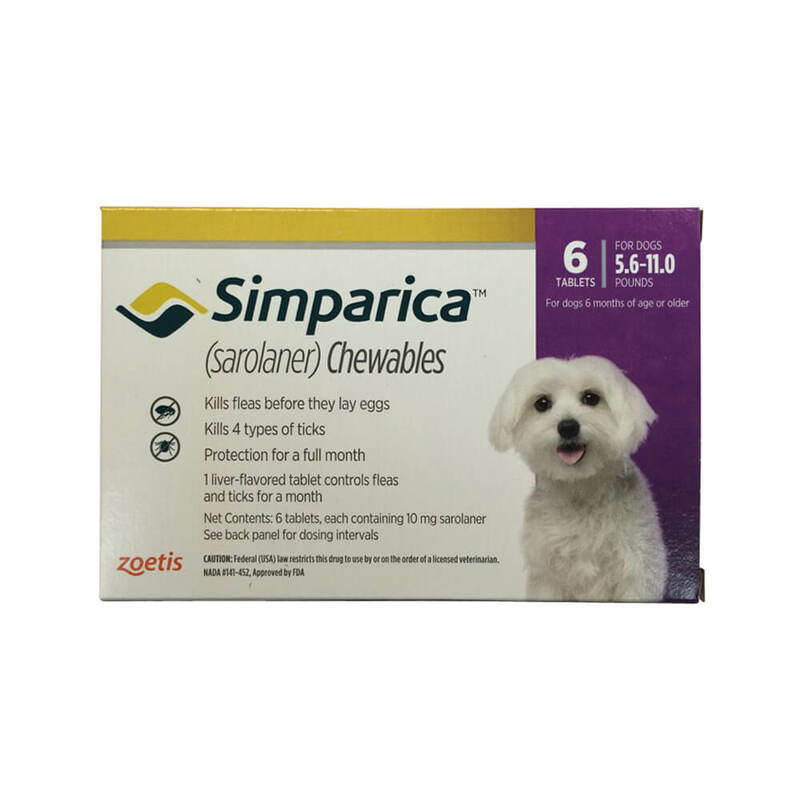 Simparica is a chewable tablet. If your dog is experiencing an infestation, this can provide the relief they are looking for as well as improve signs of allergies brought on by fleas. Don't forget that fleas and ticks sometimes carry life-threatening diseases, so keeping your pooch protected is a must! Simparica is offered in many sizes, depending on the weight of the dog. It is offered for small dogs weighing 2.8-5.5 lbs, 5.6-11 lbs, 11.1-22 lbs, 22.1-44 lbs, 44.1-88 lbs, and 88.1-132 lbs. Each packet comes with six chewable tablets.